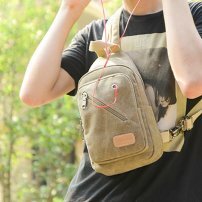 Canvas Waterproof Repellent iPhone / Cellphone / Samsung 7.0 Tablet Chest Bag : allputer.com - Accessories for all your Portable Electronics & Computers! Adopting one-shoulder strap design, the bag can act as a single-shoulder bag/sling bag, or a cross-body bag for use. Safely store and organize your cellphone, tablet, wallet, keys, ID card, credit card, small snacks, and other small personal belongings. - Vintage Canvas bag with multiple pockets. - A bag that you can make sure your belonggings are safe, no worries of pick-pockets and at the same time, you don't need to hold it witn your hands. - Go as there is not a bag with you! - Structure: 2 Front zipper pockets, 1 main zippers pockets , 1 interior zipper pocket on the back, 1 slip-in slot. - Material:It's made of High density cotton canvas.